A herniated disc (also called a “slipped” or “ruptured” disc) may cause pain in the neck, back, arms, or legs. It occurs as a result of a sudden injury or through a slow degenerative process. Dr. Brian Haycook of Orthopaedic Associates of St. Augustine is one of the best spine doctors in the area and he routinely treats patients suffering from a herniated disc. A disc is a soft, rubber-like pad located between each vertebrae of the spine. The discs make it possible for the back and neck to bend and also act as shock absorbers for the body’s activities. Each disc is made up of a thick outer edge of cartilage and a gel-like substance on the inside (nucleus). A disc ruptures when the center nucleus protrudes through the edge of cartilage – placing pressure on nearby nerves and often causing pain, numbness or weakness. Back or neck pain alone is typically not enough evidence to diagnose a herniated disc, but the presence of any of these other symptoms is often a good indicator of an aggravated disc. Diagnosing a herniated disc begins with a conversation with the patient. We will ask where you feel pain and whether you recently experienced an injury that may have caused a disc to rupture. A physical examination will help us determine where the pain is coming from. Additional tests such as X-rays, MRIs and CT scans will also be used to help us come to an accurate diagnosis. Most herniated disc cases can be treated with non-surgical treatments like rest, over-the-counter medication, muscle relaxers, and injections. Patients are usually asked to reduce their activity and avoid any bending or lifting until the disc fully heals. Cortisone-like injections may be considered if such treatment doesn’t relieve pain. 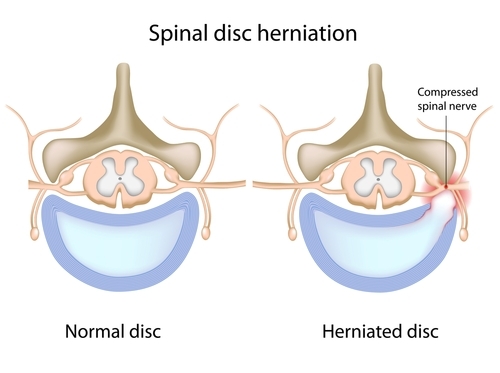 Some patients may require surgical treatments and there are several procedures available for correcting a herniated disc. If you’re experiencing symptoms associated with a herniated disc we recommend scheduling an appointment online so you can get fully evaluated. For more information you can contact us at 904-825-0540.